Available with most WHITING® roll-up door models. Ideal for insulated doors and doors with custom paint or graphics. WHITING®'s Black Brush side seals offer the best level of protection against debris and water ingression, keeping your door panels and components in good condition for longer. They also prevent water and dirt from getting into the compartment, protecting cargo from damage and your staff from slips on a wet surface. Brush seals are longer lasting than vinyl seals, meaning lower maintenance costs and vehicle downtime. 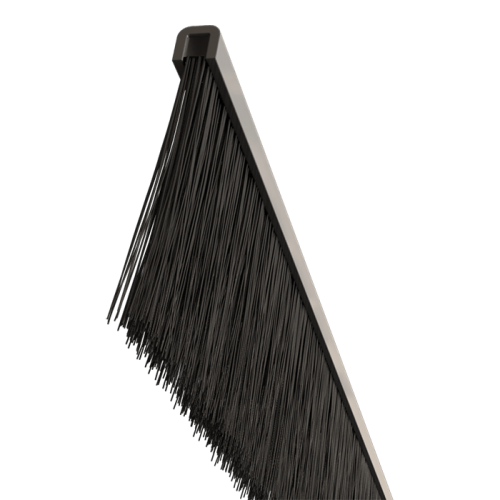 The flexibility of the brush bristles conform to irregular surfaces (such as rivet heads) to reduce air flow into the compartment, which is critical for insulated models with temperature-sensitive cargo. They are also less abrasive against the door exterior, meaning that your roll-up door will continue to look pristine long after it has left our factory—perfect for doors with custom paint colors or graphics. Comes as standard with WHITING®’s HingedTRUSS II and C4 door models.